Tower Hamlets Homes gives information on their website on how to report anti-social behaviour (ASB) here. 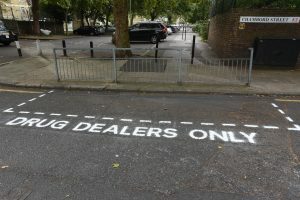 All residents will have noticed the increased drug dealing and using on our estates. Members of the Columbia TRA are actively working within the Weavers Community Action Group (WCAG) to tackle the ongoing issue. Meetings of the WCAG take place every month. All residents on the Columbia Estates are welcome to join those meetings. Please see our events page for details of the next meeting. Reporting guide - It is important that residents continue to report incidents of drug-related ASB to the police and council to ensure the issue is given high priority. The WCAG has created a reporting guide which can be found here. Impact statements - The police and council use impact statements in court proceedings to give magistrates and judges, who aren't familiar with a given situation, an awareness of the impact crimes have on individuals and the community. This enables them to determine a fair and considered sentence that fits the crime(s). The WCAG is regularly asked by the police and council to provide impact statements from members of the community and so far the statements submitted have led to positive outcomes. Please help us by writing your own impact statement. To help, WCAG has developed guidance and a form for residents to use. Once completed, the form can either be submitted by email to northweavers@gmail.com or paper copies can be handed in to Nazrul Islam who runs the Dorset Community Association.